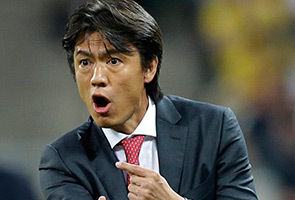 SEOUL: South Korean football coach Hong Myung-Bo announced his resignation Thursday following a disappointing World Cup showing that saw his team jeered and booed on their return from Brazil. "As of today, I am leaving this post", Hong told a press conference in Seoul. "When we left for the World Cup, I said we would give hope to the people but we ended up giving them disappointment. I really feel sorry about that", he said. Hong's decision to step down came just a week after he received a vote of confidence from the Korean Football Association (KFA) who said he should coach the national side through the 2015 Asian Cup tournament. The coach and his players were criticised by the South Korean public and media for failing to advance beyond the group stage in Brazil, managing just a draw with Russia and then two defeats to Algeria and Belgium. When the team returned home, angry fans unfurled a banner at the airport saying "Korean Soccer is Dead" while others pelted the players with toffees -- a particularly insulting gesture in South Korea. Hong had offered to step down immediately, but last week KFA vice president Huh Jung-Moo said the association had persuaded him to stay. While acknowledging the frustration with a winless World Cup, Huh had argued that replacing Hong was "not the best solution". "We expect him to lead our national team for the Asian Cup based on the experiences and lessons he learned during the World Cup," he said. Hong, 45, was a star defender and captain of the national squad during the 2002 World Cup when South Korea reached the semi-final.